I work mostly with abstract or non-representational art and I particularly enjoy a collage style of design. When I think of the word "collage" it conjures up images from the latest magazines of layers of items/stuff/ephemera that is mostly unrelated to each other all jumbled on a background of some sort. I don't care for most of them as they look "scrapbooky" and very personal to me. I can see that they might have meaning to the maker, but they have very little meaning to me. When I create art I am inspired by something like color, nature, a piece of cloth or an idea. When I am creating the piece I think about what looks good and how much of this or that or where to put things. I consider composition, balance, contrast, color, and focal point. I am not only creating for myself but to hopefully successfully share my thoughts, muse and artistic skill with others. Yes, I am making things to try to sell them, so I want other people to like them. In order for someone to like it they need to see something in it that they can identify with or that moves them or makes them remember something. It needs to have meaning to them as well as to me or it is not, in my mind, a successful piece. So when I am making a collage I want it to be interesting, have good "flow", be a balanced composition, and hopefully have beauty. Not too much of anything or too little. As Goldilocks said, just right. Here are three of my series of color wheel quilts that are approximately 12"x12". 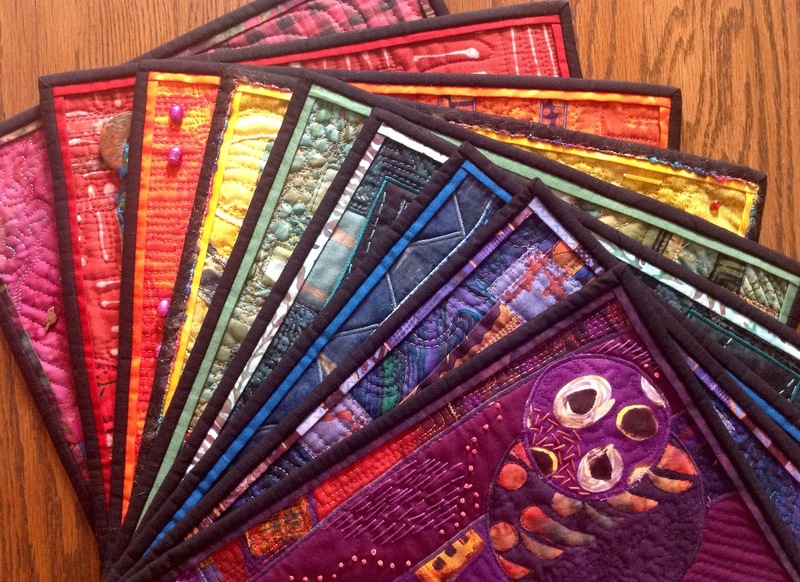 They are collages and some have beading, some have hand embroidery. All 12 of them were very fun to create and each one is unique. I made them cohesive by their size and black bindings but other than that I just went with whatever I was inspired to do with the fabrics I chose and the colorway I was working with. They are essentially monochromatic pieces and yet they are still colorful. 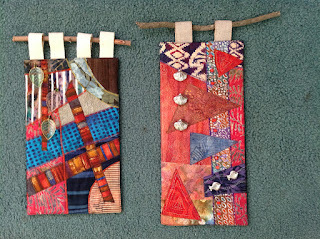 Some of the fabrics have other colors in them that help make the piece interesting. When I see these all together it is difficult to pick my favorite. I see things that I could have done better and I see things I really like. Every one is interesting, full of detail, and fairly true to their corresponding color on the color wheel. It wasn't hard to do that. I had all the fabric in my stash. And I enjoyed working with every one. 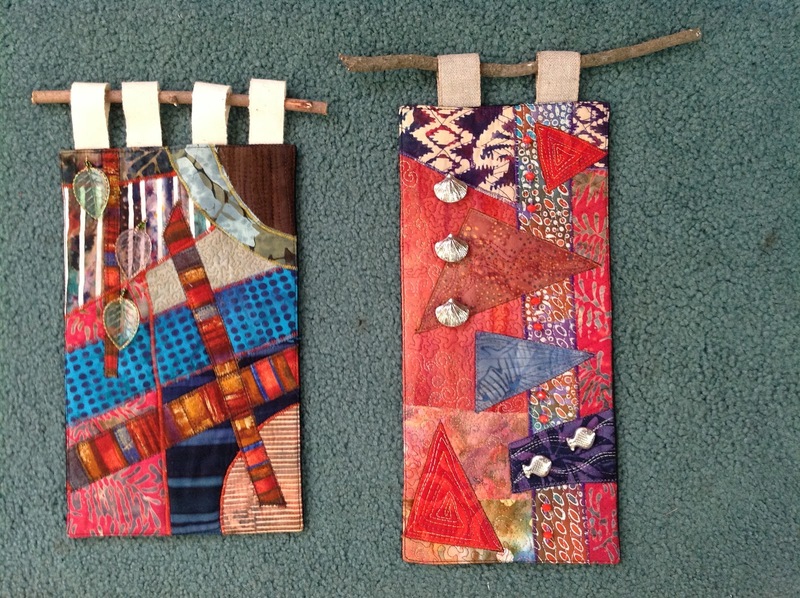 Collage does not have to be messy, busy and heavy with stuff. It can be colorful, detailed and balanced without being overdone. 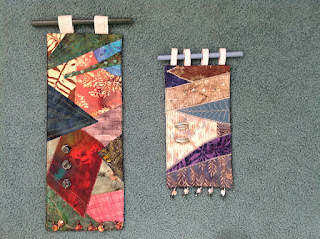 Know when to stop adding more fabric, more embellishment, or more stitching. That isn't always easy, but that is part of the process of creating art. Overdo it and you lose what you are trying to say. Don't do enough and it is boring. Find the balance. Next Saturday I am trying something new! I am holding an Open House in my home---my livingroom to be exact. I'll set up some of my display walls and hang a lot of art and see who comes to look! Hopefully I won't sit there all day by myself, but if I do at least I will be at home! So you know what I'll be doing over the next week---cleaning, baking and creating some last minute work! My recent sales have been rather slow and far between so I'm hoping to kick of the holiday season with this new adventure and attract some people who haven't seen much of my work before. The hardest part about this for me is figuring out how to advertise this on a shoestring budget. Thank goodness for the internet and email as I can get the word out to a lot of people that way. I've put it on Facebook, sent it out to my newsletter email list, and will be distributing some fliers to businesses to hand out. I submitted a public service announcement to the local paper, but that will only get published if they see fit and have room since it is free advertising. The other paper is getting back to me about how much a little ad would cost me, so we'll see how that goes. Here's an idea of what the flier looks like, although the images are supposed to be centered and the blog seems to be refusing to do that! many older pieces on display and for sale. P.S. - I bake. And I’m not above bribery. So if you are in the area please stop in and see me! I'd love to show you what I have been up to....!! The life of an artist is one of constant evaluation of what you are doing, why you are doing it, how you might do it better, and how you can share it with others and sell it so you can continue doing it! This past year I have not created as much as I did previous years and I have had some setbacks with efforts to teach and show my work. I'm hoping for a more positive response to my classes this next year so that I can pursue my goal of teaching to a wider audience in some form. Whether that is on a national teaching circuit or on-line or even by writing a book, I want to take it to the next level over the next few years. I have learned this year that I really love creating abstract collages and I would like to share my process by teaching or writing. 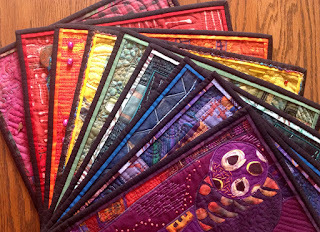 Actually I currently have an article I wrote about my color wheel series of small 12" x 12" collages that will be published in Machine Quilting Unlimited in May of 2016. I think there is more to my process than what I can share in the magazine article so I may be able to write and teach about it in more depth. That series of work has also been accepted to a national quilt show as a special exhibit in fall of 2016 so that is also very exciting! At this point in my art "career" I need to move to a new phase. What I have been doing has been somewhat successful but is not moving me forward. It is all a bit stagnant at the moment. A new gallery is my current goal and I will be checking them out next month in Bozeman, Montana. Wish me luck! Making these small collages solidified to me that I love color and the collage process. My earliest pieces as an art quilter were collage and since then I have done many of them although I have also experimented with some whole cloth pieces, some long narrow strip quilts ( "Strata Quilts") and even some landscapes. Right now the collage style seems to be what I am inspired to do. And inspiration is key to my productivity so for now that is what is coming out of the studio!